My Creative Flavors: A Bouquet of Coconut Blooms for Auspicious beginnings on Ganesh Chaturthi !!! A Bouquet of Coconut Blooms for Auspicious beginnings on Ganesh Chaturthi !!! Happy Ganesh Chaturthi to all our Readers!!!! Shree Vakratunda Mahakaya Suryakoti Samaprabha, Nirvighnam Kuru Me Deva Sarva-Kaaryeshu Sarvada" The essence of the mantra is that I meditate on Sri Ganesha, Who has a curved trunk, large body, and who has the brilliance of a million suns. O lord, please make all my works free of obstacles, always!!! On Ganesh Chaturthi, Lord Ganesha, the Vighnaharta, is worshipped as the God of wisdom, prosperity and good fortune and to remove all the obstacles from the life, and bestow auspicious beginnings and blessings!!! On the podium of life, besides relishing Modak's and Ladoo's, the auspicious festival resonates with the reality of life with beauty and grace!!! It's indeed time to seize the moment, to be embellished with a noble, kind, compassionate, humane heart and soul in the journey of life, echoing an aura of positivity and spreading happiness and excellence ...!!! 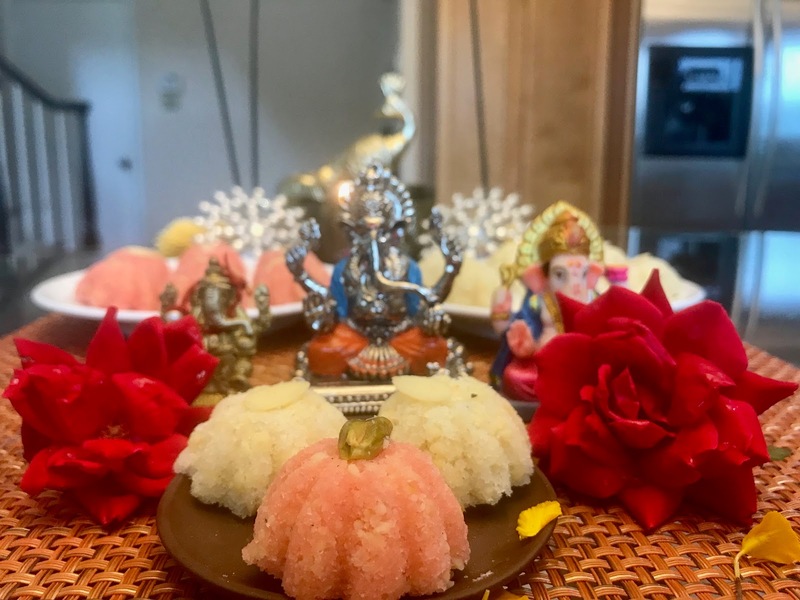 With the flurry of flowers, People bring Ganesha idols at home. Family and friends come together to celebrate this festival. The much-awaited festival of Lord Ganesha is celebrated with loads of zest....!!!!! Though the festival is celebrated across the nation, Mumbai is famous for the most famous Ganpati pandals and celebrations. 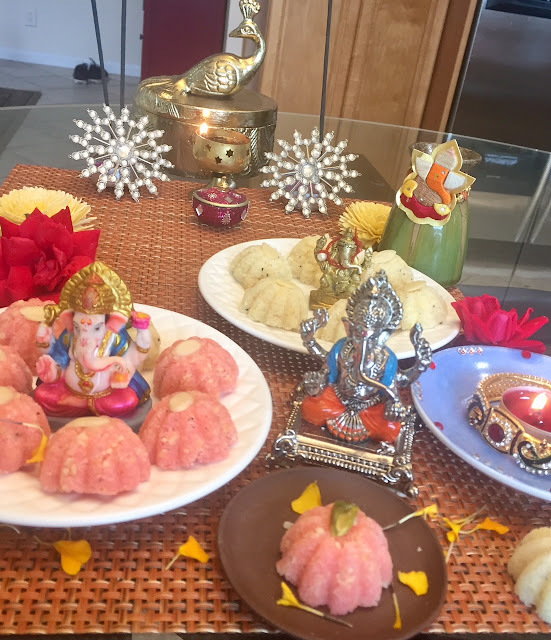 The Ganeshotsav ends with Ganesh Visarjan of the idol or the more preferred eco-friendly idol at home or even with the Supari. The festival gives a valuable lesson of life which is a mash-up of joys and sorrows - learning the art of living with grace in times of both pleasure and pain; learning the art of attachment and detachment; learning the art to let go with dignity in amity and sorrow, the pleasures of the materialistic world in a flash as we all have to immerse all the worldly desires one day and merge with the subtle colors of mother nature. The celebration and immersion of Lord Ganesh is marked with an important message that people should accept the eternal cosmic law of nature that which took form has to become formless again. It is a never-ending cycle - chakra of life birth and rebirth. This cycle is infinite, one who has taken birth has to die and take re-birth according to their Karma. "The Lord neither arrives nor leaves. He has existed before time and will exist beyond. We Arrive, We Celebrate, We Merge into the elements...."
Lord Ganesha, a Symbol of Wisdom & Blessings!!! A Bouquet of Coconut Blooms for Auspicious beginnings on Ganesh Chaturthi, to mark the symbolic celebrations at home !!! Simple and Sweet Melt in Mouth Coconut Blooms!!! Roast coconut powder in ghee, add condensed milk, cardamom powder and rose syrup, rose essence in a partial batch. Make another batch plain white. 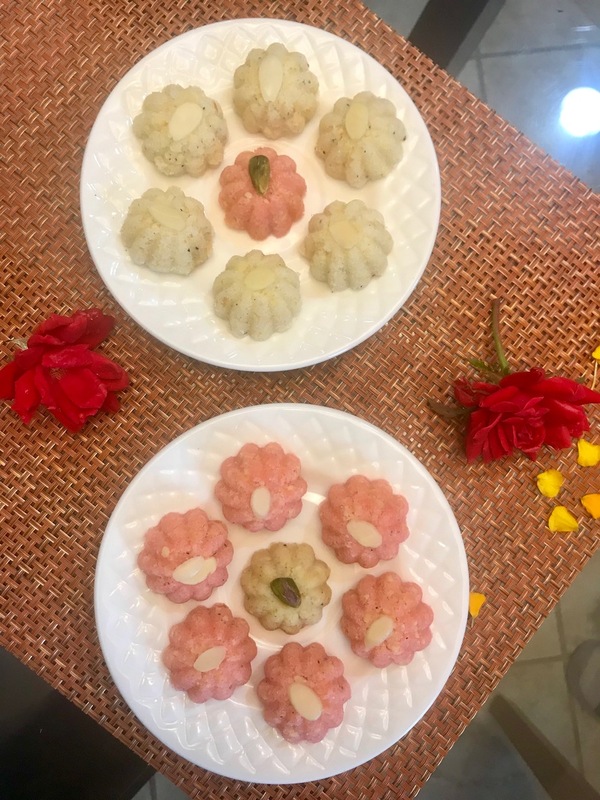 Put it in moulds or shape like a ladoo and sprinkle coconut powder and nuts. Sliced almonds and pistachios for garnish. Dry roast the khoya. Add ghee, milk n saffron, sugar or condensed milk, coconut powder if using, cardamom powder. Mix well to get a dough like consistency. Let it cool down a bit and shape or mould it as you like. Enjoy, Eat, Pray and Love !!!!! As we all know the family which prays together, stays together!!! BEAUTIFUL and BLESSED LIFE !!! Thank you so much for your sweet words! Have a wonderful day ! Regards,MCF ! Lovely coconut blooms, Sonia! I imagine how sweet their aroma and taste! Thank you very much, Rosa ! Cheers and have a wonderful day !